22-Jul-2014 -- On the way to Sardinia and Corsica, I took the chance to visit the confluence point 44N 11E. This confluence is located at the mainland of Italy. By coming from the North at the narrow and very curvy road SP24, we soon reached the region of the CP 44N 11E. After the village of Monachino, then some lonely buildings of the settlement Acquerino, the stony bridge "Ponte a Rigoli" (leading over the creek Limentra), a sign with "Parallelo 44°" on it, at both sides of the road, appears, which already shows the particular geographical condition of this place. A place to park next to the road was quickly found. Under good weather conditions the hike started going west to visit the crossing with the 11th longitude. 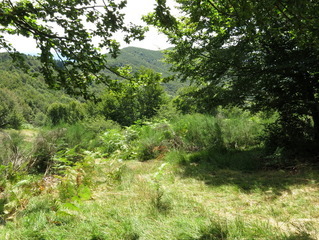 To reach the CP it is necessary to cross the natural reserve "Riserva Naturale Biogenetica Acquerino". On a byway soon the hiking trail No. 11 was reached, which is marked red/white on several trees. This trail leads uphill until it reaches another trail No. 00, which you have to follow to the right (northwest) to reach the CP located about 450 m away. The last 170 m southwest to the CP are reachable only by walking cross-country downhill. Before that it is possible to have a great look at the flat area of Pistoia. The ground at the CP was used to produce hay. Brooms and small trees are growing scattered around. A small house is located lower. Soon the necessary pictures were taken and the zeros on the GPS-display appeared after a short confluence dance. Heading back along the trails 00 and 11, the mentioned bridge and later the car were soon reached. No other hikers were seen during the way up and down again. All in all the successful CP-visit was finished within about two hours. After the visit of CP 44N 11E the journey continued by visiting Vinci, the birthplace of Leonardo da Vinci and by taking the ferry to Sardinia at the harbour of Livorno.